Yeap. 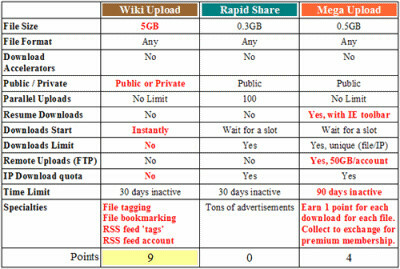 Wiki Upload is a winner when compared to RapidShare and MegaUpload. RapidShare will remain a bad choice unless they change their download/upload policies. Next time, you’re in the office/home and you wanna send a large file out, use Wiki Upload. Have fun with it! Next Next post: Looking For Sound Effects?